Let’s get the “big deal” out of the way first. After a shaky first 3 quarters, we pulled it out in the last couple of minutes. My team now has 8 wins in a row! Geaux Saints! Whew. Stand is turned on its side and you’re looking at the bottom. I used the big “cubes” I got off a couple pallets for squaring up and blocking a couple corners – just ‘cuz. Also stuck a couple 1.25” x 1.25”’s under the bottom cross-pieces to raise the stand-platform/tablesaw-top to the correct height. Spent way too long on this and it was game time. After the game, I went back out to work on figuring out what I wanted to do with the unaccounted for space in the width of the mobile base. (Cabinet width + tablesaw stand width + unaccounted for space width = mobile base total width [yeah math… um, no.. I hate math….]). 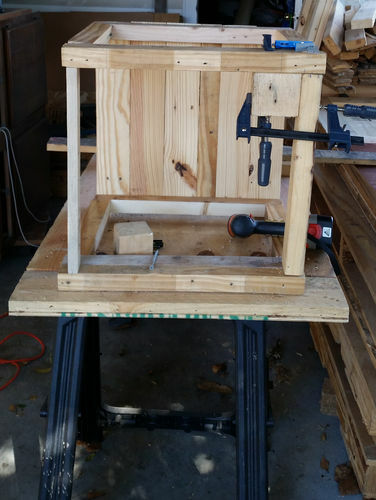 Moved things around, got a brain freeze a couple times and finally figured that I would use the space between the saw stand’s side and the left cabinet as a vertical cubby for a yet-to-be-made crosscut sled. So, that’s what I worked on until it got dark – which it did promptly at 5:03PM. Outside & carport lights came on and progress slowed appreciably as they aren’t the greatest. The picture makes things look brighter than I felt they were… and at this point I was tired of “workng” so I decided to “play” by experimenting with my first half-lap joint. I’d show the result but it was actually kinda embarrassing. I only eyeballed the heights of the two pieces so I cut out way too much in both pieces and was off by about 1/4” after placing them together. 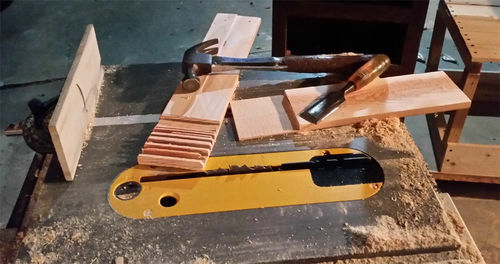 But it was a good experience as I learned ”don’t eyeball… measure, then measure again – both with the pieces to be cut and with the saw blade height”. (Sound ike I said that before – “measure twice, cut once”? Told you I was slow… In my case, some lessons apparently need to be learned and re-learned and re-re-learned). That was my rather tedious day. Snail’s pace progress, but progress nonetheless. 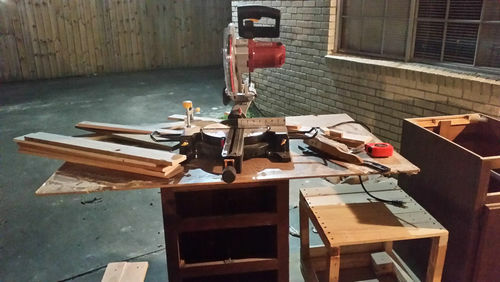 Simple - I'm starting from scratch, with an under-the-carport shop space, a small budget and Lumberjocks/Youtube as references and inspiration. We'll where it goes. You can use your miter saw to do the cuts as well, just set the depth gauge screw on your saw then after the first two cuts adjust it by half the thickness for a perfect fit.